This summer more than ever people will be choosing to stay home in order to save money. So why not make your home as comfortable as possible. If you don’t already have an air conditioning unit, it may be time to start looking. Many homes may have central air conditioning; these units are great but when you are trying to save money, why not cool off the rooms that you are in rather than an entire house. 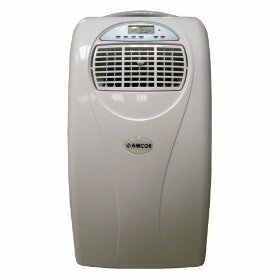 Amcor Portable Air Conditioners are one of the leaders in the portable air conditioning industry. Their line of portable air conditioners is one of the best. There are a few units that stand out, these units are energy efficient, cost effective and they will provide any room you choose with the perfect cooling temperature. Now is the time to start shopping around, if you wait until it gets hot out the prices you may find now may go up. The Amcor AL10000E is a portable air conditioning unit that has the cooling capacity to cool off a room up to 300 square feet. This air conditioner is considered to be energy efficient and it has self-evaporation technology, by talking the water from the air, the water passes through the system, making it more efficient. This portable a/c contains a built in water tank with a drain outlet so you can drain out the unit yourself to ensure a better working a/c. The best part of a portable a/c is that you can use it in any room you feel needs cooling the most. 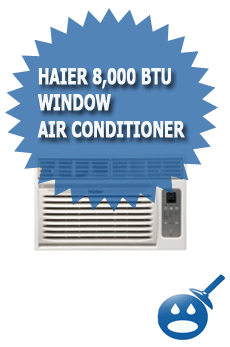 It works with a 10,000 BTU cooling power and it uses a regular 115V. It is important to read the manual before plugging in the unit. Read any warming it may have regarding extension cords. The AL10000E has a fully operational LCD remote control, so you can program your unit from any place in the room. The unit comes with a window mounted exhaust kit; this air conditioning unit has to be vented with the exhaust hopes and window kit provided for the best operation of the unit. This Amcor AL10000E has a dehumidifier for the removal of 60 pints of condensation per day. The unit has a backlit LCD display for easy reading and it comes with a 24-hour timer, perfect for saving money. This Amcor Model PLM12000E Portable Air Conditioning unit doesn’t look like your standard portable air conditioning unit. It has a sleeker more plasma style look to it. But the look of the unit doesn’t take away from the performance of this unit. The PLM12000E has Amcor’s patented Auto Drain NanoMist Technology, this technology works by getting rid of excess fluid that build ups in the unit. By using an autodrain, you will never have to drain your air conditioner unit again. This model comes with the AutoDrain NanoMist Technology but Amcor’s patented Evaporative Booster Technology, which gives the home a more efficient cooling, and it will save you money on the electric bills. The Amcor 12,000 BTU Portable Air Conditioner also comes with 3 speeds, two of these are fan speeds and the third is a turbo speed. The unit was created with a cooling capacity of up to 400 square feet and it comes with a backlit LCD Control Panel. This unit differs a bit than the Amcor 12,000 BTU Portable Air Conditioner; this unit has a heat function plus some other wonderful features. The Amcor 12,000 BTU Portable Air Conditioner with Heat has the Evaporative Booster Technology as the previous unit as well as a fully operational LCD remote control. You can set this unit from any place in the room. There is one single exhaust hose for easy installation. This unit has a built in water tank with a drain outlet located at the bottom of the unit. An indication that the unit is full is that when the air conditioner is full of water, the compressor will stop working. But if you use the unit on a continuous basis then you should empty the unit on weekly basis to ensure proper operation. The PLM12000EH has a programmable timer and a heat function included. This unit uses a 3M filter that helps remove bacteria, pollutants, dust and other contaminants from the air. The Amcor 12,000 BTU Portable Air Conditioner with Heat or Model PLM12000EH has a dehumidifier that gets rid of moisture in the air, up to 80 pints a day. The unit has an easy to clean filter that should be cleaned every week or so, depending on how often you are running the unit. A dirty filter can affect the way your unit runs so be aware of the filter. The unit has a 24-hour timer, perfect if you are at work all day and you want to program the unit to start up an hour before you come home. The PLM12000EH uses a standard 115 voltage. It is important to read the manuals before plugging in the unit; some portable units are not made to be plugged into an extension cord. 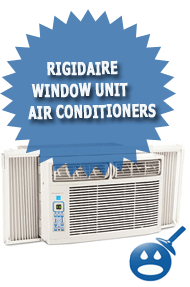 This unit can cool up to 400 square feet. If you are trying to save money this summer but foregoing those summer vacations, then why not invest in a portable air conditioner to help you and your family cool while you enjoy all the comforts of home. 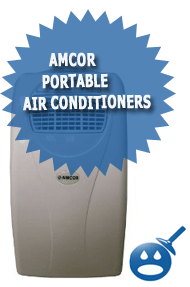 Amcor Portable Air Conditioners are high performance, high quality air conditioners. If you shop around you can find the best prices as well as possible deals.